Area size relevant to players - but this will probably suffice for pretty much all ages. On introduction of balls you will need to increase the middle channel to around 10m especially for the older players. Players are organised into pairs with one player assigned as the runner and one the tagger. If you have an odd number; give him a different colour bib and he can work as an extra tagger, meaning the runners have to check for two taggers not one. 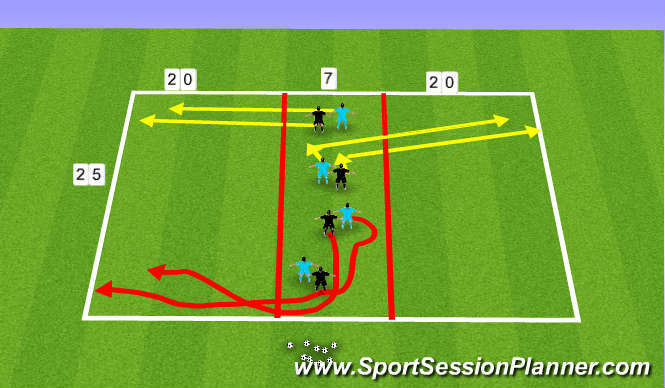 The middle channel is a safe non taggable zone where the runner can make movements to avoid tagger and if he is clever use other players as blocks. The lead player - white in this case - attempts to run to either sideline without being tagged. 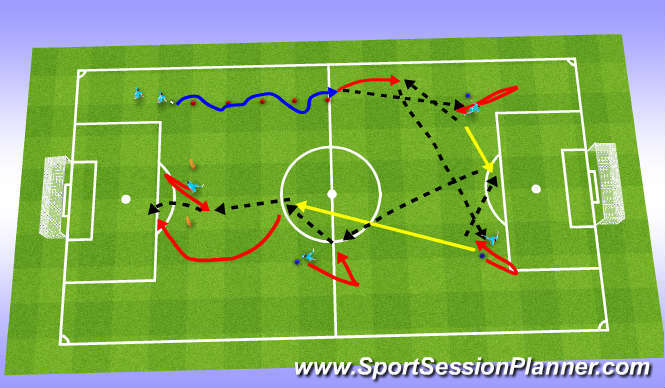 Leaders should look to evade taggers in the middle zone with quick foot movement, constant checks of their shoulders and accelerating and decelerating movemement sbefore accelerating away to reach one of the sidelines. Awareness of tagger and consequently the timing of movements are the key. Each group should work as leader for 3 mins. The leader now has a ball at his feet and the exact same process is followed with the tagger with no ball chasing the dribbler with a ball. Initially you will get no success - probably in the case of young players for a couple of sessions. With Under 18s I got minimal success in reaching the end line. But you will see progressions; your best player at any age will be able to do it.